Coping with the Social Security shortfall is even easier than the chart suggests. In 2030, after adjusting for inflation, average income in the United States will be almost 50 percent higher than it is today (assuming a fairly modest two percent growth in real GDP per person); even if growth is painfully slow by historical standards (say, one percent per year), average incomes will be 20 percent higher in 2030 than they are today. 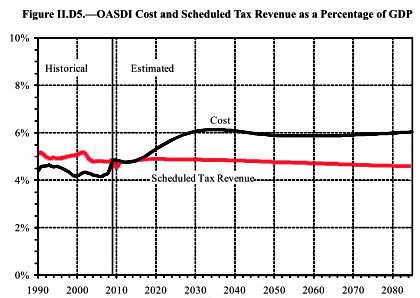 So, in 2030, when the gap between Social Security costs and revenues hits 1.5 percent of GDP, we’ll have to pay that 1.5 percent out of a much larger income than we have today. Even after making up the Social Security shortfall, future Americans will still be substantially richer than we are today.